Richard Nangle, he of the recent court testimony in the Larry Cirignano case, has left the Telegram, and is moving onto the state Department of Social Services. First Milton Valencia left for the Globe, and now RN’s gone . . . this leaves very few people on the Telegram & Gazette staff I trust to do a thorough, accurate job of reporting local stories. Related: T&G circulation collapsing, T&G prints election results wrong twice in a row, T&G reports City Council vote exactly wrong. Below: Maybe it’s too goofy a picture for a sad event, but I prefer to remember the good times. 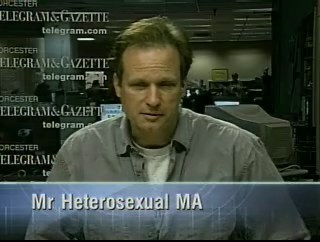 Richard Nangle reports on Mr. Hetero. Bottom line, the ruling in the Commonwealth vs Cirignano trial proves Sarah Loy had no right to disrupt the â€œLet the People Voteâ€ rally on December 16, 2006. Therefore, there is no reason to pursue the criminal complaint against her. KnowThyNeighbor received a telephone call from former Catholic Citizenship Director Larry Cirignano, last evening to tell me that late Friday afternoon, Shari Worthington officially pulled the papers ending her criminal complaint which accused Sarah Loy of “Disturbing a Lawful Assembly.” By Cirignano’s account, Worthington did this as an act of good grace on her way to bringing her teenage daughter to Children’s Hospital for a serious back problem. A jury of 6 men and women found Larry Cirignano not guilty of misdemeanor assault and battery in Worcester today. There were no strong emotions on anyone’s face as the verdict was announced. Cirignano was mostly impassive, with the occasional mild smile. Loy and her supporters frowned a bit, but then everyone was frowning as the jury’s deliberation dragged on for its second day, and a hung jury looked increasingly likely. Sarah Loy had no comment. Bay Windows has a statement from Cirignano’s lawyer. I’m hoping either they or the T&G can get some comments from jurors. I’m 40 minutes late. Celebrity blogger Michael Ball, who was there on time, later told me that the prosecution asked Shari Worthington why, when she was able to take care of all sorts of other business, she declined to file a criminal complaint against Loy until just before the Cirignano trial. Ball of course didn’t like her testimony. An elections “advance man,” govt and politics work, worked with various Republican presidents. Got “roped into the gay marriage issue” following some events in 2003. Describes the work of an advance man. Deals with all details for a VIP at an event. Coordinates with law enforcement and private security. Describes “catch and release.” When someone approaches a speaker or unfurls a banner you get them out of there right away and release them. “‘Catch’ is to get them off the stage.” Describes it as “shock and awe.” (I have no idea what he’s thinking of, but this seems like precisely the wrong metaphor for the use of minimal force.) You talk to them first. Never put your hands on someone. You can guide them but never physically get involved in an altercation. 508 is a show about Worcester. This week, Mike is joined by Brendan Melican. You can download the mp3, subscribe to the feed, or see other formats. First: Worcester has been attacked by winged invaders. Then: If you’re reading this, then you know Mike’s been sitting in on the Cirignano trial this week. Brendan is excited about his upcoming Mayoral Candidate Forum at the Dive Bar. No word if the candidates will be drinking, but Brendan will. Talk about casinos in Massachusetts, and Mike gets spammed by City Council Candidate John Mahoney. Correction: I say Bill McCarthy in the podcast, but this was a mixup on my part. McCarthy is no longer running, which is why Mahoney was able to re-enter the race. Many apologies. I got there like 20 minutes late. A woman was in the midst of testifying who was Lauren McCarthy’s mom. She’s a teacher at QCC. Bay Windows report on day 1. At another point, Mr. Gilleran claimed that Mr. Nangle was â€œvery interestedâ€ in the story, as though a news account about a protester who bruised her elbow at a rally would catapult a reporter to the editorial pages of The New York Times. A guy was fixing the courtroom doors this morning, while the lawyers and judge were discussing things inside. Channel 3 was gone, but the T&G’s Dianne Williamson was there this afternoon. The T&G lawyer again tries to get Nangle to not have to testify. Another witness for the prosecution. 25 year old Worcesterite and counter-demonstrator. Was at the back of the main demonstration. The judge denies the motion to keep T&G reporter Richard Nangle off the stand. He’ll likely be testifying, as he was a witness to part of the event in question. Ex-WoMag reporter Noah Schaffer is present in the courtroom. He’ll be writing an article about the Courthouse for Boston Lawyer’s Weekly. During the morning break, several Cirignano supporters arrived. One predicted that Cirignano’s opponents would “flood” the courtroom on Friday. This doesn’t seem likely. Only 7 of the 8 jurors returned today. Remember the juror who approached the bench as the jurors were leaving yesterday? He’s gone.